Hey there everyone! Happy Friday! I hope you’ve had a wonderful week. It’s been a busy one here, but today all of that hard work pays off and I get to reveal my Great Outdoors Challenge project! If you remember, I announced the challenge earlier this month. I invited some of my insanely talented blogging friends to join in with me on the blog hop, but all of our incredible readers were also invited to join in! The rules were simple. 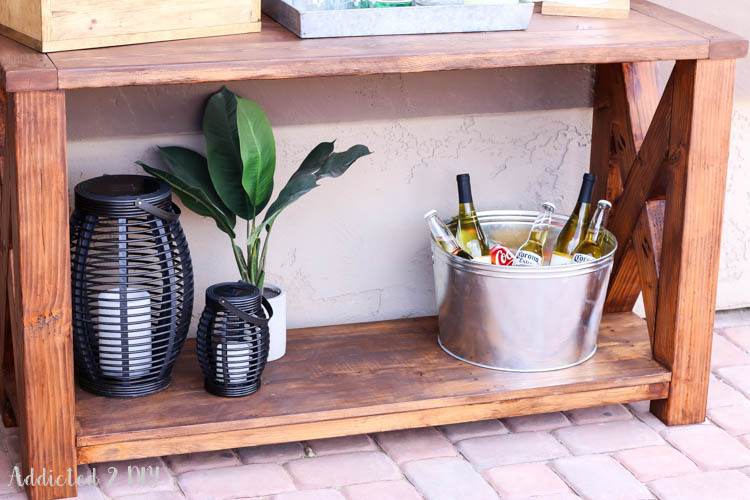 Create an outdoor project using wood, metal, concrete, or whatever you like. It just needs to have a building element to it. Pretty simple, right? Did you participate in the challenge? If so, be sure to link up your project at the end of this post! No website necessary! 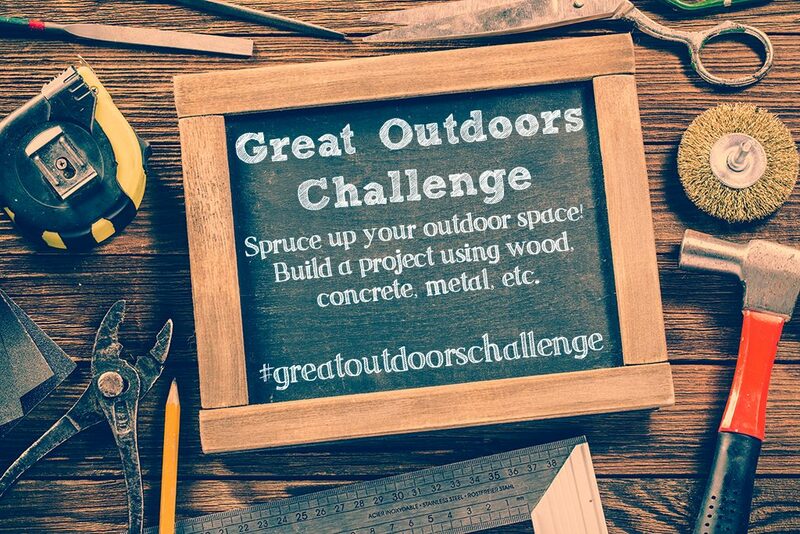 Just link up your picture and make sure when you share your project on social media, you use the hashtag #greatoutdoorschallenge so we can see everyone’s creativity! 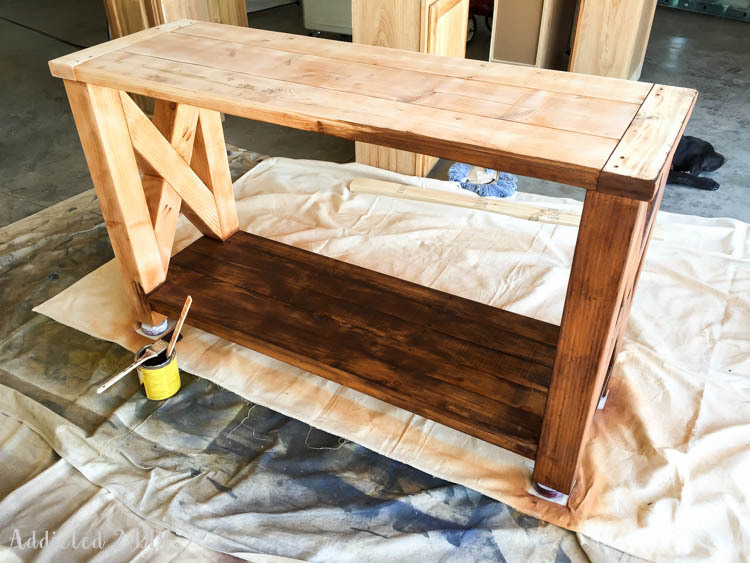 My project for this challenge was inspired by the Benchwright Outdoor Console Table from Pottery Barn. I loved the look of it, and I hate the bakers rack shelves that we currently have on our back patio. They served a purpose at our old house, but in this house they somehow became a drop zone for a bunch of random stuff. I knew this would be a great piece of furniture to add to that spot. 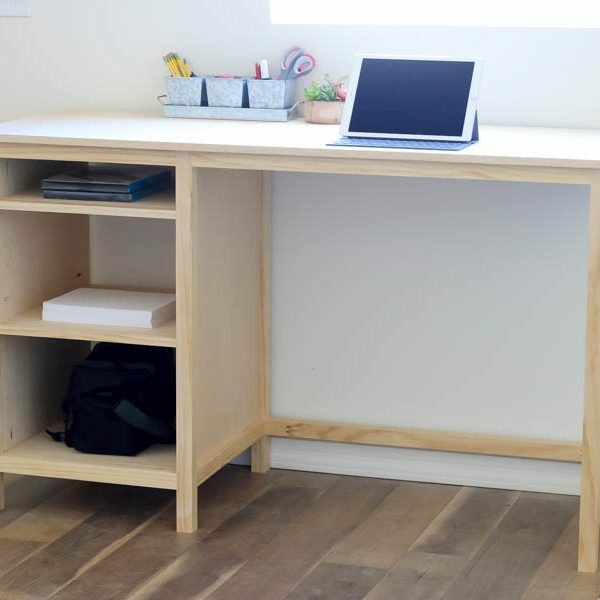 Plus, I built it for only $60 in lumber! Even I was a little shocked! 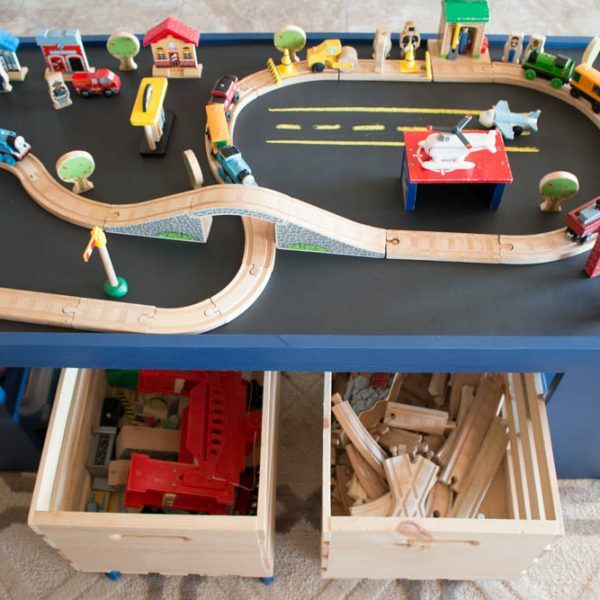 If you want to build one of these for yourself, I’ve drawn up the free printable plans for you to download. I started by assembling the legs. 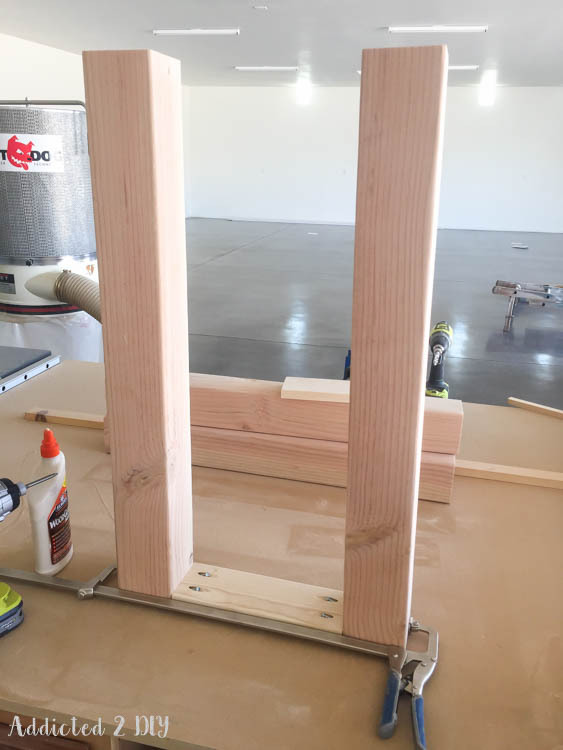 I drilled 3/4″ pocket holes with my Kreg Jig into the 1×4 top supports and attached them to the legs with wood glue and 1 1/4″ pocket screws. 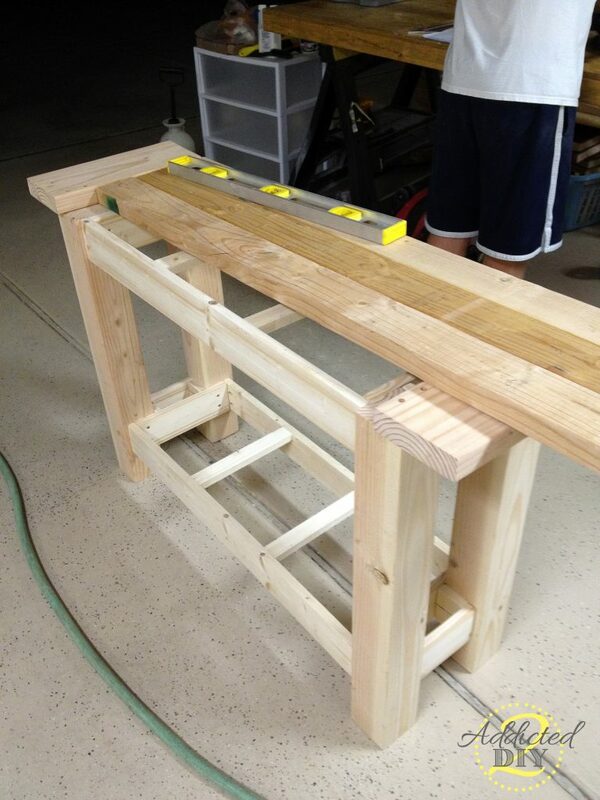 Once the legs for each end were assembled, I assembled the support frame for the bottom shelf. I drilled 3/4″ pocket holes into the ends of the front and back 1×2 supports as well as the cross supports. I attached them all with 1 1/4″ pocket screws and wood glue. For the 1x2s on each end, I attached them to the 4×4 legs with 1 1/4″ wood screws and glue. 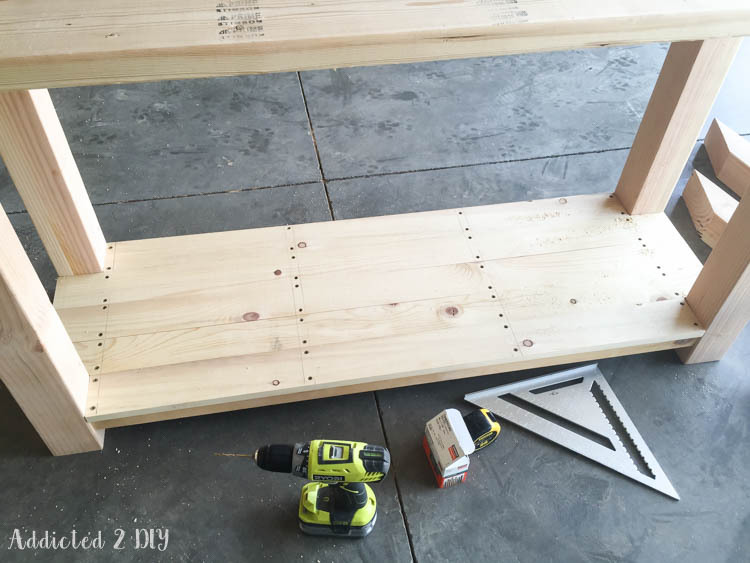 I cut and attached the bottom shelf pieces using wood glue and 1 1/4″ wood screws. To determine the angles and lengths of the X braces, I held the 4x4s up to the legs and marked the angles with a pencil. 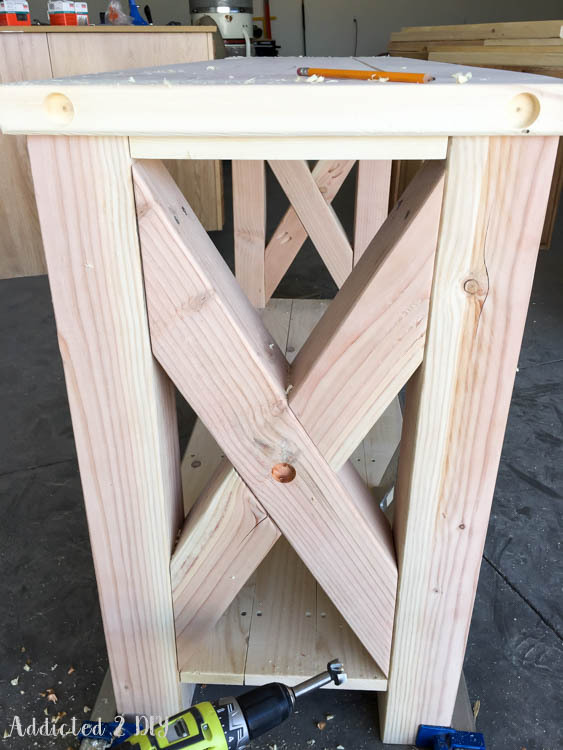 For this it ended up being a 60 degree angle for each end of the long pieces and 60 degrees for the short pieces with a 30 degree angle meeting in the middle. To attach the ends of the X brace pieces, I drilled 1/8″ pilot holes and drove 3″ wood screws into the 4×4 legs. It’s a tight spot to drill the holes, so my offset drill adapter worked like a charm to drill the holes and drive in the screws. 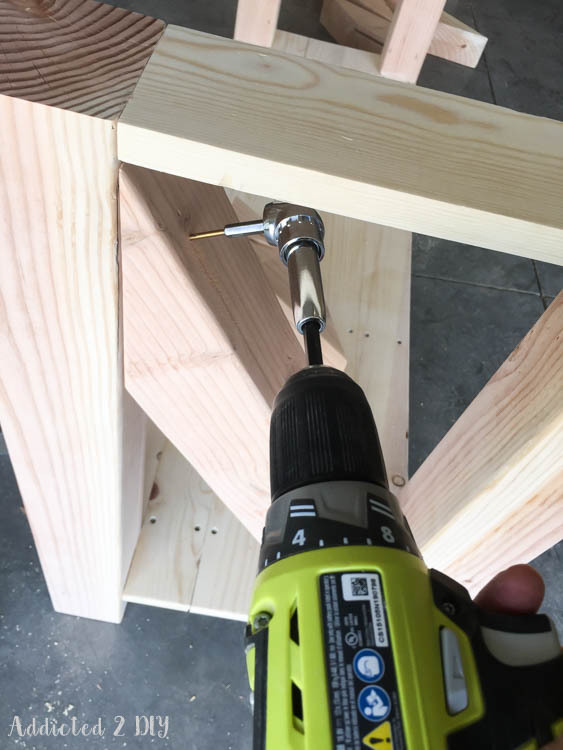 I used my impact driver with the offset attachment to drive in the 3″ screws. 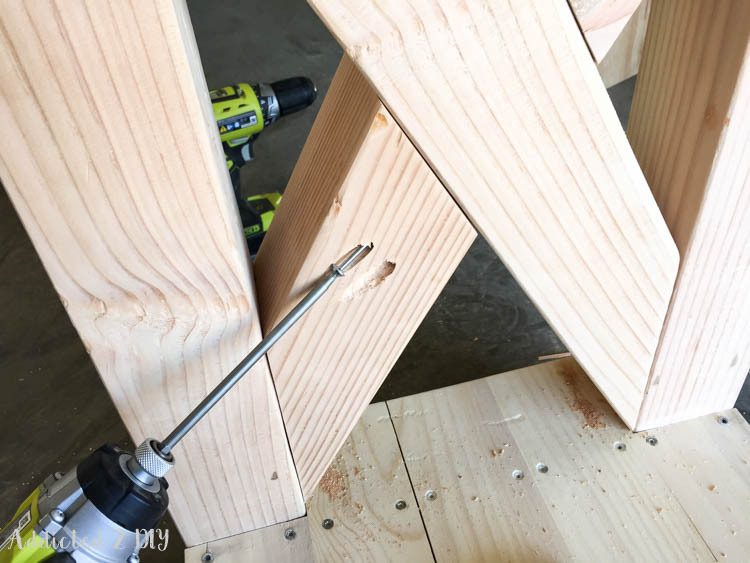 I used my Kreg R3 to drill 1 1/2″ pocket holes into the 30 degree angled ends to attach them to the center of the X brace with 2 1/2″ pocket screws. 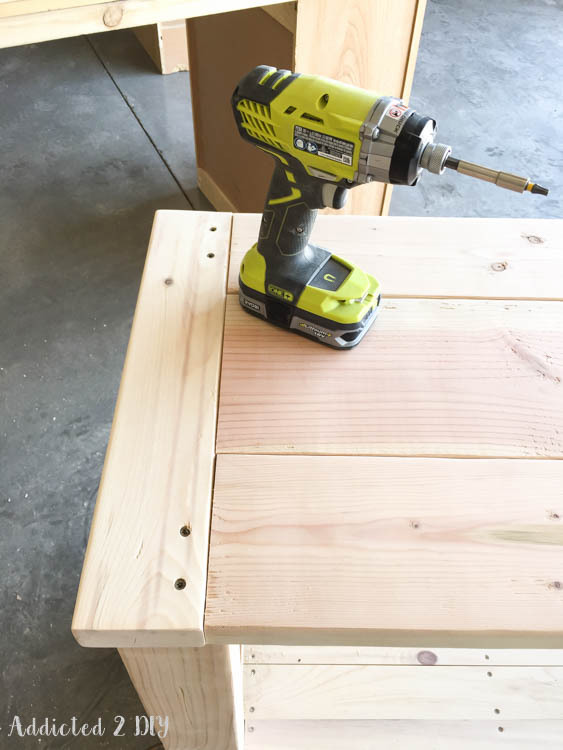 To assemble the table top, I drilled 1 1/2″ pocket holes into the inside edges and the ends of each of the 2×6 and 2×8 planks. I attached them all together with 2 1/2″ pocket screws. Once they were attached, I cut the breadboard ends to size and then clamped and attached them to each end of the table top. 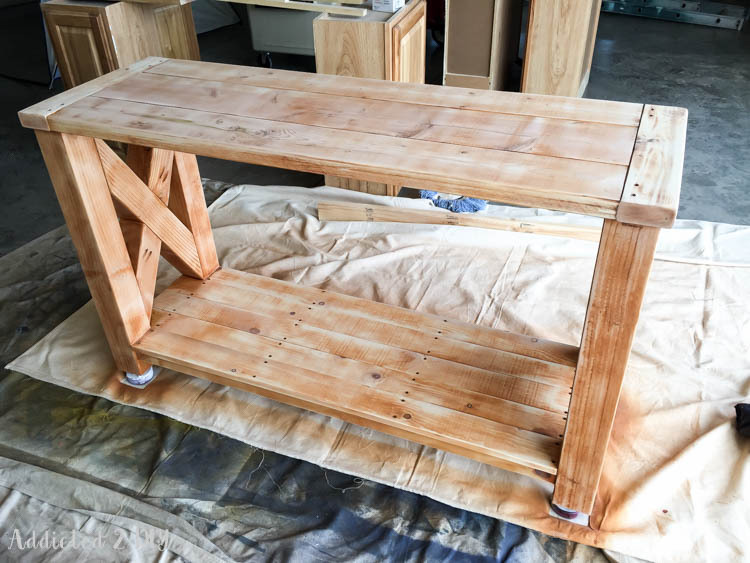 I sanded it all down, then flipped the top and drilled 1/8″ pilot holes into the breadboard ends to attach them to the 4×4 legs with 3″ wood screws. For added strength, I also drove 1 1/4″ wood screws up from the bottom of the 1×4 top braces into the breadboard ends. 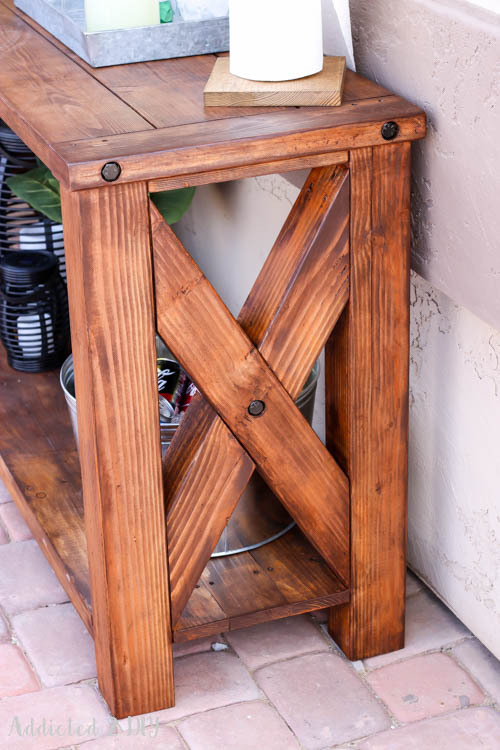 The Pottery Barn version of this table has bolts in the centers of the X and on each corner of the breadboard ends. 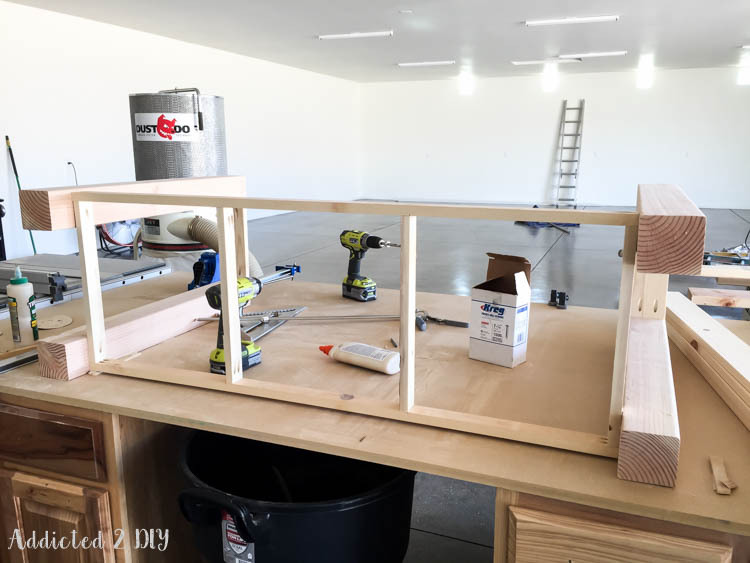 I loved that look, so I grabbed a 1″ forstner bit and drilled out my holes about 1/2″ deep. I then used a 27/64th drill bit to drill the pilot holes for the 3/4″ lag bolts to screw into. Here’s the point where everything went horribly wrong. None of us are perfect and no project of mine ever goes without a hiccup. 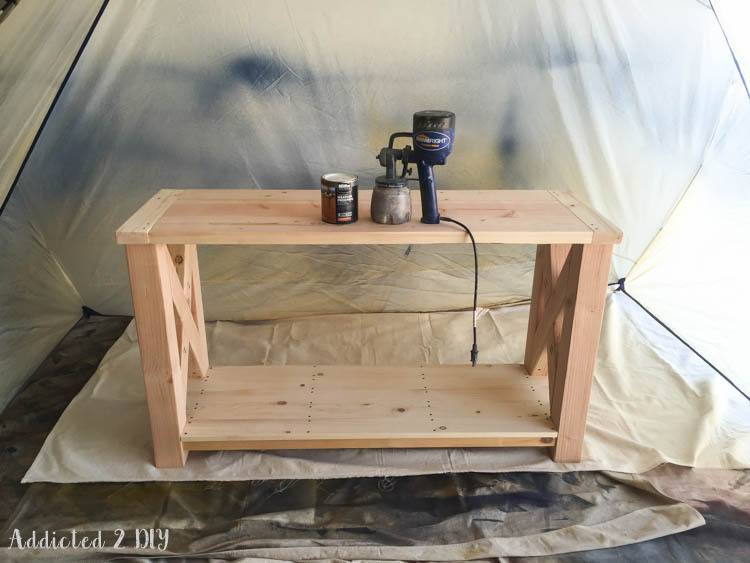 I shopped around for a transparent weather-proof stain and settled on Behr weatherproof stain in natural cedar. It looked okay on the wood swatch, and we all know you can trust those swatches, right??? I set up my spray shelter and Finish Max got to spraying the stain. A smart person would have stopped after the first leg came out looking a little orange, but I figured it would lighten up once I wiped all of the stain down. I sprayed the entire thing. Big mistake! Unfortunately, it left me with a bright orange monstrosity! I was devastated! I’ve said many times that a great project can be ruined by a bad finishing job and I had just fallen victim to that. It was not the beautiful finish I had been hoping for. I panicked and was tempted to drag it out in the yard and light the whole thing on fire and then go cry in a corner. Thankfully some of my blogging friends talked me out of grabbing the gas can and suggested I try gel stain. I have never used gel stain before, so that thought hadn’t even occurred to me. Normally, you wouldn’t use a regular stain on an outdoor project, but this will be under our patio where it is shaded 100% of the time and not exposed to any of the harsh elements of the Arizona desert. I sanded the entire table down. I didn’t go crazy with the sander, but figured I’d take off a good amount of the stain to tone down the orange. 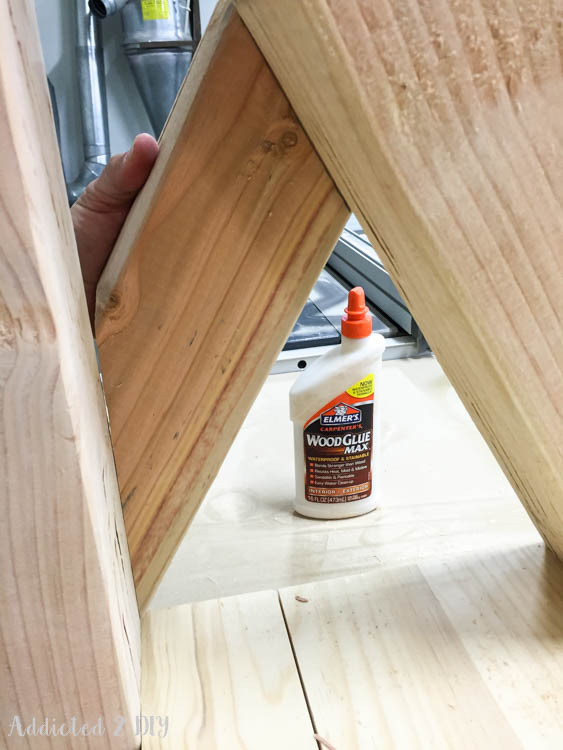 I bought some Minwax gel stain in hickory and tested it on a small area. Success! No more ugly orange! I was so happy my project hadn’t been ruined. I thought for sure that this was going into the scrap or burn pile. It’s proof that none of us are perfect and sometimes you just have to keep trying to get things figured out. I forgot to photograph the next step, but I sprayed my 3/4″ lag bolts with oil rubbed bronze spray paint and then screwed them into place with a 3/4″ ratchet. I just love the rustic, industrial look they add! I’m so in love with the end result! 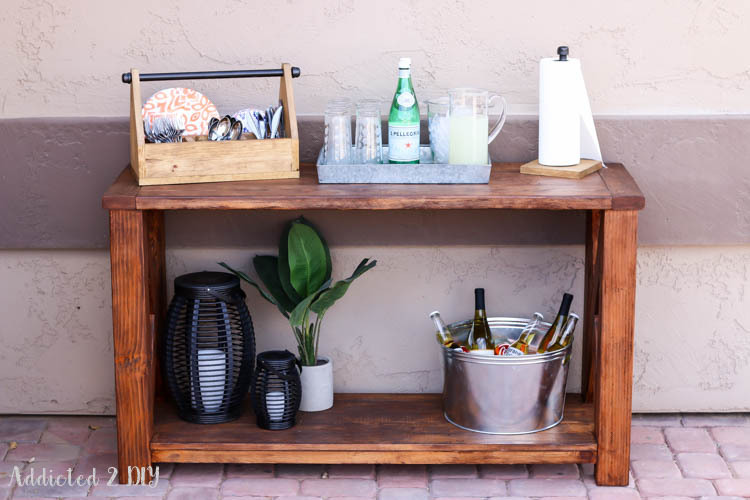 At nearly 5′ long and just over 18″ deep, the finished table is the perfect size for a drink station or even a buffet for backyard parties. I was nervous about how the color would turn out with trying to fix my staining issues, but I’m so happy with it! Oh, and that cool dinnerware caddy and paper towel holder are DIYs too! I’ll be sharing the tutorials for those with you all tomorrow! 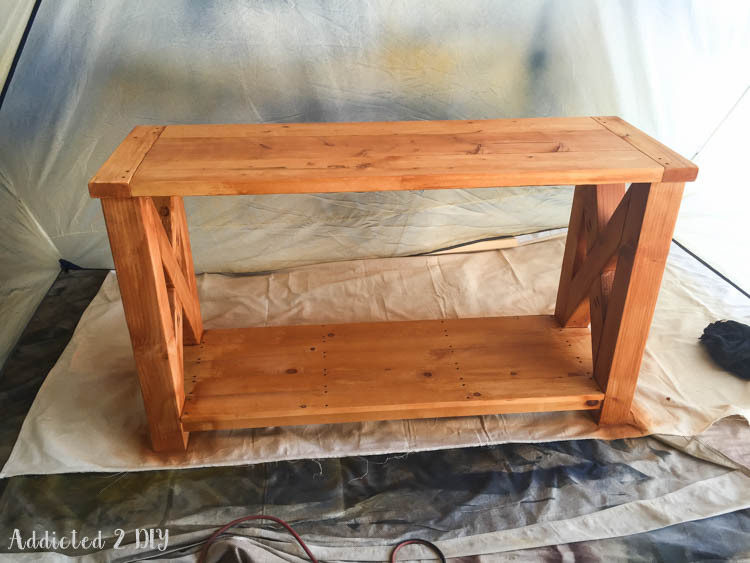 Don’t forget to download the free plans for this DIY rustic console table. Just don’t stain it orange like I did. Unless of course you want it to be that color;) Have you ever had a project not go according to plan? Definitely know that you aren’t alone. It happens to all of us! Now you definitely want to go check out the outdoor projects from my friends! Also, if you participated in the #greatoutdoorschallenge, make sure to link up to the link party below! I can’t wait to see what everyone created! *This post contains affiliate links to product used for your convenience. For more information, please read my disclosure statement. Katie it’s gorgeous! Magazine worthy and the finish turned out beautiful despite the trouble. Nicely done. That is too kind, Jaime! Thank you so much! This looks AWESOME Katie! I’m so glad it actually worked out. Nothing worse than a project you’re proud of going awry on the last step that’s supposed to make it even snazzier looking. 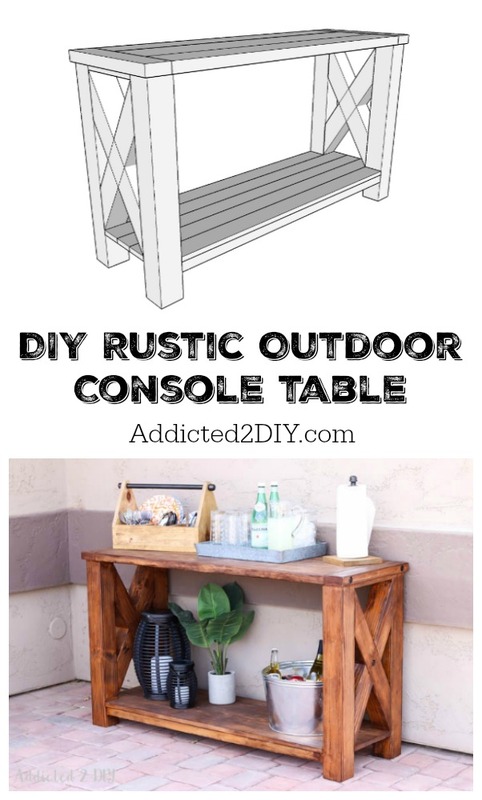 Sarah @ The Ugly Duckling House recently posted…Outdoor Challenge! Thank you, Sarah! Haha! Yes, it is quite the downer when you work so hard and then make a mistake like this. I’m so glad it worked out too! We’ve all been there! Even those of us who do this for a living. The best part is, you didn’t give up and the final result is beautiful!!!! The industrial look of the lag bolts (painted) is the perfect ending to this story. 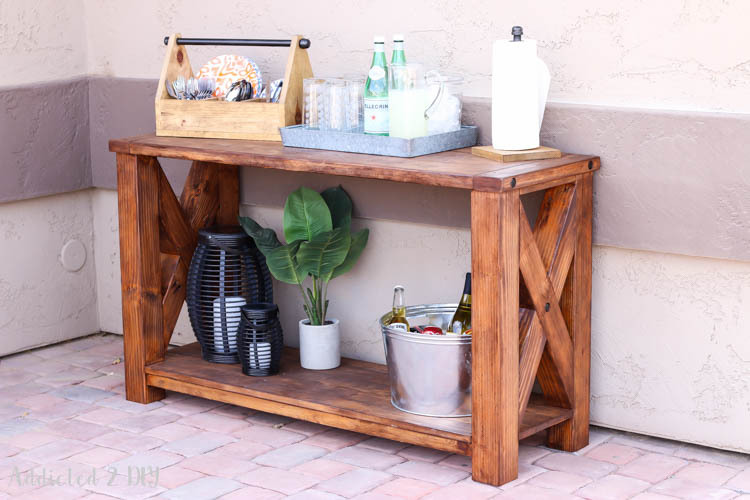 I love the look they give your outdoor console table! ps thanks so much for putting this challenge together! Thank you so much Gail! Yes, I’m definitely glad I didn’t give up! Thank you Mindi! Yes, I definitely am adding gel stain to my fnishing arsenal from now on! It turned out so good! The stain looks great now and the lag bolts totally give it that extra touch to make it look professional. Great work my friend! Thanks, Elisha! Yes, I was so pleased with how the stain turned out! Such a relief! The table is gorgeous! I love the final color! And those lag bolts are just the best touch! Anika recently posted…12 Easy DIY Mother’s Day Gifts to wow Mom! I love the design of your outdoor console, got to love those chunky X’s. I’m super jealous of that awesome shop you’re working in 🙂 The color turned out beautifully! I loooove it!! We just finished building a picnic table with similar legs, so this will go perfectly as a sideboard against the house! We used old wood from a tree fort we tore down, so the legs weren’t in as good a shape as the top. I’m now dealing with a 2-tone stain effect that I’m not entirely thrilled with. This gives me hope that I might be able to salvage it after all! Great job! Thanks so much, Natalie! Yes, definitely don’t give up! While I wasn’t at first wanting the color it ended up being, I actually love it now! 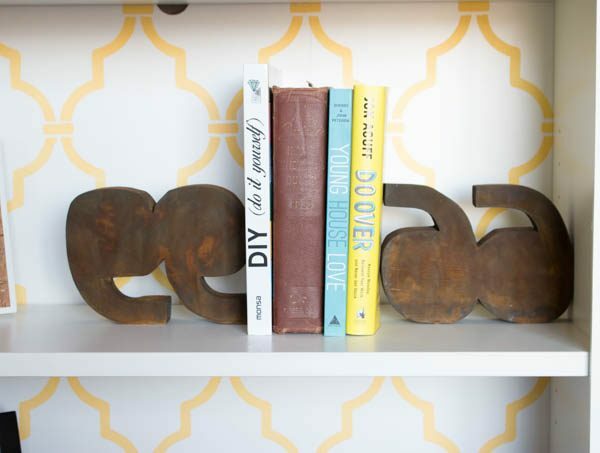 Keep playing around with scrap pieces and see if you can get something to stick! This is so nice I would use it INSIDE my home! Great job! Wow, this looks awesome! 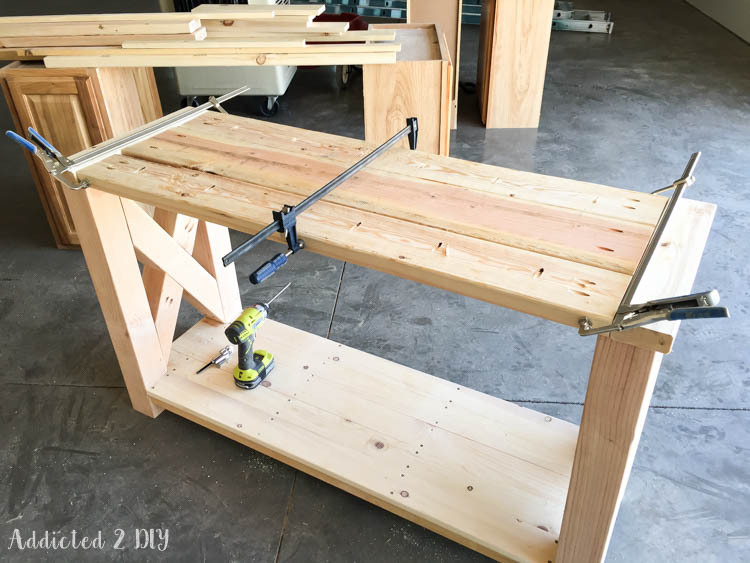 It’s always great when DIY bloggers display each step in their projects; it definitely makes it easier for people to follow when they have such a thorough guide. Great post! Thanks so much for sharing! Thanks so much, Mary! It is actually a really quick project! You could have it done in a matter of hours! How did the shelf and top hold up with being outdoors? Any expansion gaps? There are a few tiny gaps on the top, but the wood was still a bit wet and shrank when it dried. As for the overall integrity of the table, it’s holding up fantastic over the past 2 years.